It is Christmas week, and I won’t be publishing commentaries on Christmas Eve or Christmas Day, in case any of y’all thought I was insane. On 17 December the PRICE OF GOLD lost $27.20 and silver 53.5¢. In two trading days since the gold price has gained back $31.10 and silver 61.8¢. Ever watched a fight where one of the boxers kept getting knocked down but kept rising from his knees and jumping up to get his licks in? That’s how this trading looks. These closes meet half my test for silver and gold prices, namely, closes above $1,080 AND above $14.40. Picky, yes, but “Ahh, take the cash and let the credit go/Nor heed the rumble of a distant drum,” as Omar Khayyam said. There’s more and better. 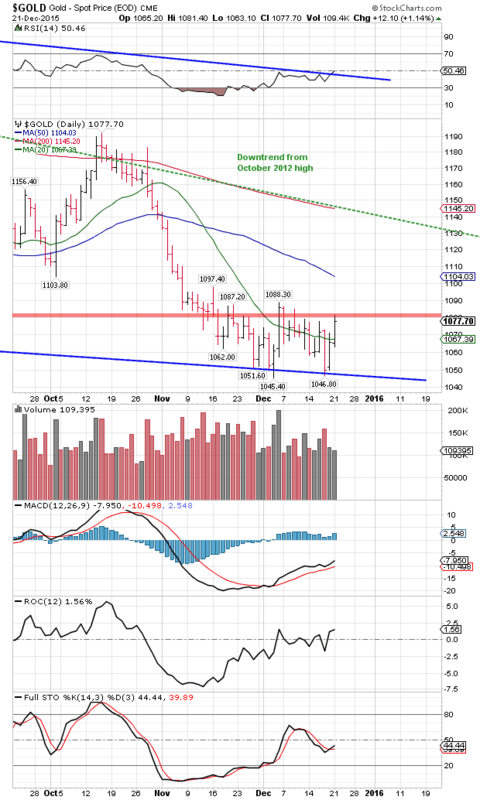 The gold price has posted a double bottom at (intraday) $1,045.40 and $1,046.80. Look for yourself, chart on the right, More, the price of gold is now knock-knocking at overhead resistance just above $1,080, and today punched through its 20 DMA. 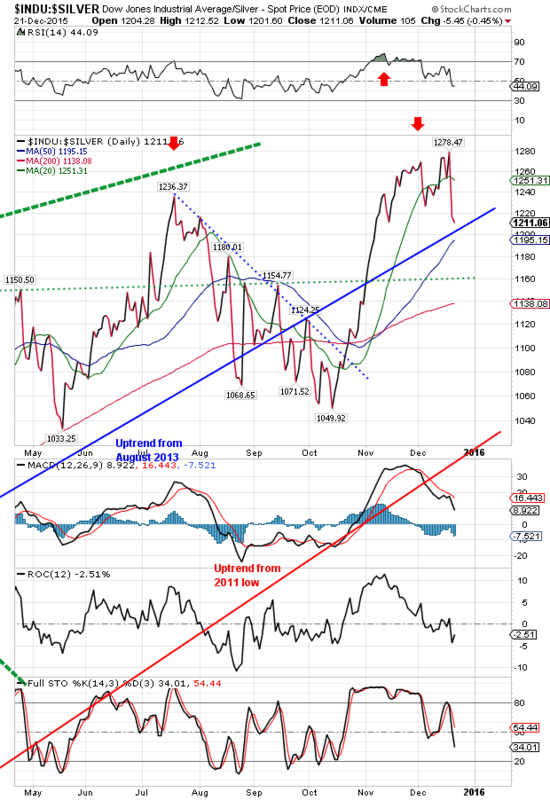 MACD, ROC, RSI all point up. Now this is a goofy holiday week and on Wednesday nobody will be trading, so those few black-shirted take-no-prisoners traders who show up are liable to run the stops down below, but that will be only an anomaly. Otherwise should be a calm week. 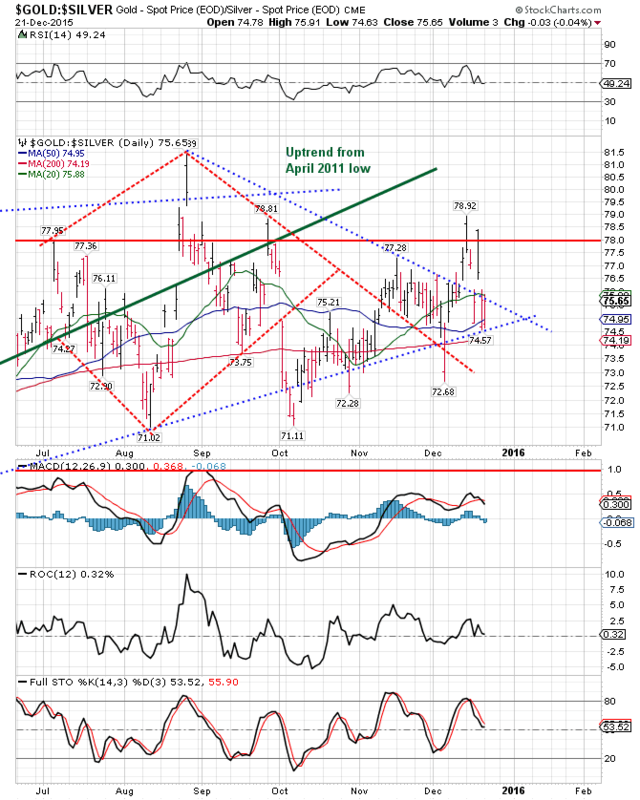 The SILVER PRICE also has posted a double bottom at $13.81 and $13.62, or is forming an upside-down head and shoulders. Either way the indicators all point up, silver rose today up through its 20 DMA, and ’tis knocking at overhead resistance at $14.40. SMOKIN’! Durn, I forgot to mention that the Commitments of Traders reports just get more and more bullish for both metals. And the US dollar’s pump is sucking air. Looky here, I forgot something else. 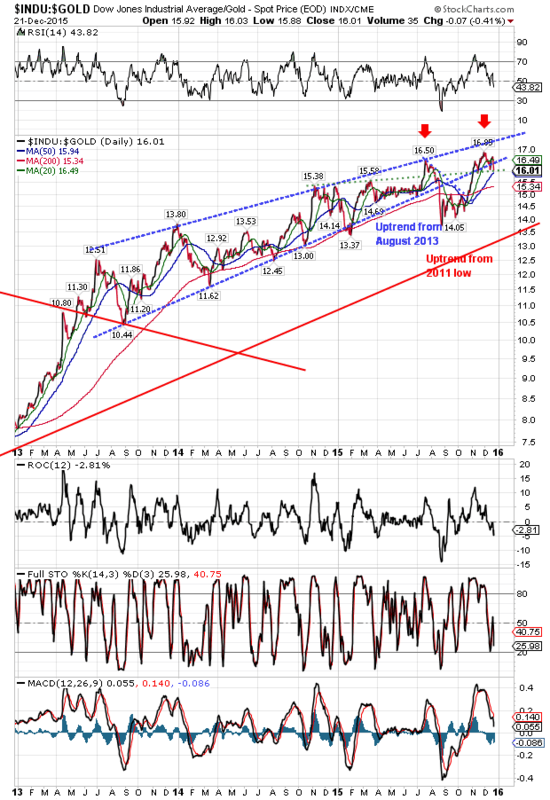 That GOLD/SILVER RATIO is collapsing, nearly to the 200 DMA, as it should be if silver and gold intend to rise. Okay, my friend CS, NOW HEAR THIS: It appears silver and gold prices have bottomed, although I want silver to confirm tomorrow by blasting through $14.40. And REGARDLESS what metals do in the next week, the Fed has made sure the correction is behind us and that next year will be the Year of the Silver and Gold Price, with paper money hiding in a toad hole. I’m always so mealy-mouthed. Did I make that plain enough? By the way, American Eagle one ounce, one-fourth ounce, and one-tenth ounce gold coins are experiencing rising premiums. This happens in December almost every year because the socialist US Mint can’t adjust production to meet demand for the new year’s mintages. Avoid those high premiums, they will return to normal when the 2016s come out in mid-January. More I think about it, the crazier the Fed’s plan to tighten money supply in the face of a recession and declining economy becomes. They may really sink the ship this time. Stocks regained today about a third of what they lost Friday — not a sterling achievement. S&P500 gained 15.6 (0.78%) to 2,021.15 while the Dow added 123.07 (0.72%) to 17,251.62. It’s nothing more than a bitty bounce off the lip of that upside-down bowl, preparatory to falling through. Look at a 15 month Dow and a 3 month S&P500 chart here, http://schrts.co/vtdPMb The coming step through the manhole will be obvious. Weeping, wailing, gnashing of teeth, and sharp sorrow will follow. Dow in Gold and Silver punched further down, despite stocks’ rising. Dow in gold has again fallen out of the bearish rising wedge formed since mid-2013, the one that falsely broke out to the downside in August. It traded back up into the wedge, but now has fallen out again, and below that uptrend line from August 2013. Indicators nearly unanimously point down, like the spirit of Christmas past. Dow in Silver traded down in October through its uptrend from August 2013 and below its 200 DMA and acted as if it intended to visit the earth’s core. It reversed upwards, goosed by evil spirits in stocks, and even made a new high for the move, higher than July. That I interpret as a double top. 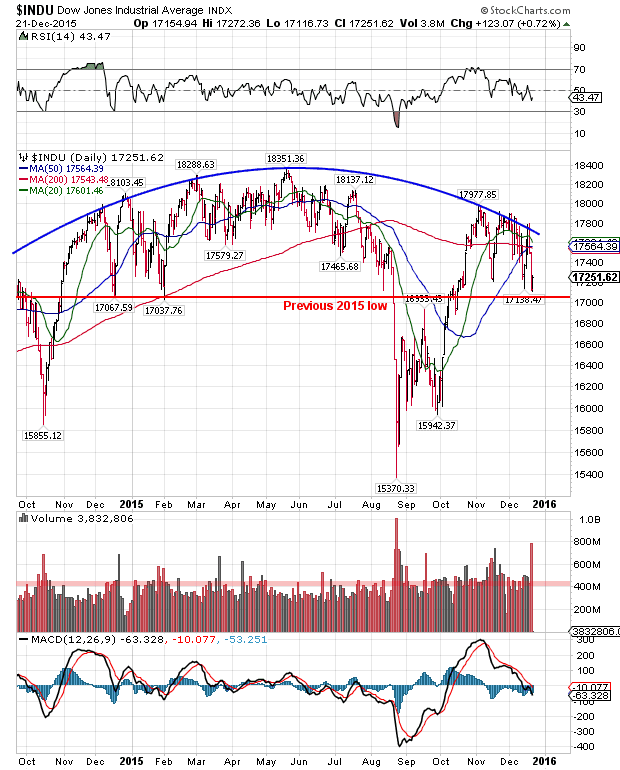 Now it has been falling straight down, and is below its 20 DMA and just about to plunge through that uptrend line and the 50 Day moving average. Dow in gold closed today down 0.68% to 15.96 troy ounces. Dow in silver diminished 0.93% to 1,205.14 troy ounces. US Dollar index gave itself the lie today by dropping 31 basis points to 98.42, slicing through its 20 day moving average (tripwire of momentum change to downward). We need a lower low to confirm the Fern (Federal Reserve note) really is a cooked gander, but the oven is heating up, the pan is ready, and the bird has been plucked. Ten year treasure note yield shrank 0.9% to 2.197%. Looks like the Fed’s higher interest rates aren’t rising. Also, it wonders me how they will pull out enough money supply, say, a trillion bucks or so, to get those interest rates up? How exactly will they do that with an economy as fragile as bone china? An old friend of mine and customer of over 15 years called chiding and castigating me today for being so negative toward gold and silver. I told her as I’ll tell y’all, they’ve beaten me up so many times with false turnarounds that now I am biting the double eagle before I accept it as genuine. I want proof. And the last two days I’ve gotten it.